on Thursday, fell short of activating Section 143 of the 1999 Nigerian Constitution, as amended, which could have set in motion the impeachment of President Muhammadu Buhari. 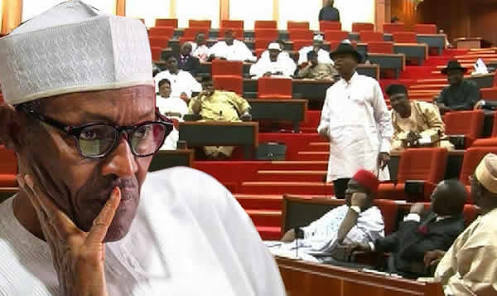 The latest move was in reaction to the alleged violation of Section 80 of the same 1999 Nigerian Constitution, as amended by Buhari, wherein he withdrew $496 million from the Excess Crude Account to purchase military helicopters without any approval by the National Assembly. The motion was moved by Senator Matthew Urhoghide and seconded by Senator Chukwuka Utazi. Most Senators spoke against the President's actions. The matter has been referred to the Senate committee on Judiciary for further legislative advice. The committee is expected to report back next Wednesday.